This post and it's subsequent parts are both a personal and professional story - a story of my first archaeological excavations as Field Director and Director at the ancient site of Sanjan, Tal Umargam, Dist Valsad, Gujarat. In the latter half of 2001 two of the most important events in my life took place and they took place within days of one another. On the 4th of November 2001 I finally finished my Ph D dissertation, thanks in no small part due to the support, determination and dedication of my wife - Rhea, but that's a story for another day and another post. I returned to Mumbai thinking my tryst with archaeology had finally come to an end when I received a call from Prof. Mani Kamerkar telling me that there was a plan to conduct excavations at the site of Sanjan and asking me whether I'd like to be the Field Director of the excavation - to say that I was shocked and elated would be an understatement. I asked for a meeting and when we met two days later she informed me that the excavation permission forms had already been dispatched. I asked if they had identified a locus to excavate and was met with surprised blank stares by her and her colleague Dr Homi Dhalla. The only hiccup, and a major one at that, was that no one had bothered to verify the existence of any archaeological mound upon which to conduct said excavations! After a quick confab with Ms Meher Kelavala (Prof Kamerkar's Ph D student who was working on the history of the Parsis in India) I took off for the Deccan College to collect toposheets and to make a very hurried and desperate exploration. My years at Deccan College and the experiences shared by my teachers were my only other weapons, armed with the toposheets and experience I made my way to the modern town of Sanjan with my father riding shotgun in our Sumo. What made me very worried was the fact that the only archaeological field researcher to venture into this area (Dr Roxana Irani) had clearly mentioned in her dissertation that the modern cement buildings of Sanjan made it impossible to find any traces of previous settlements. My brief reading on the topic had though contrary data. The modern town of Sanjan was (then) just under 150 yrs old and was built after the British got the Gaikwad of Baroda's permission to build the BB&CI railways in 1855. This town was essentially built as a railway station town which in those days was built on a railway line at specific intervals and then named after the nearest village. 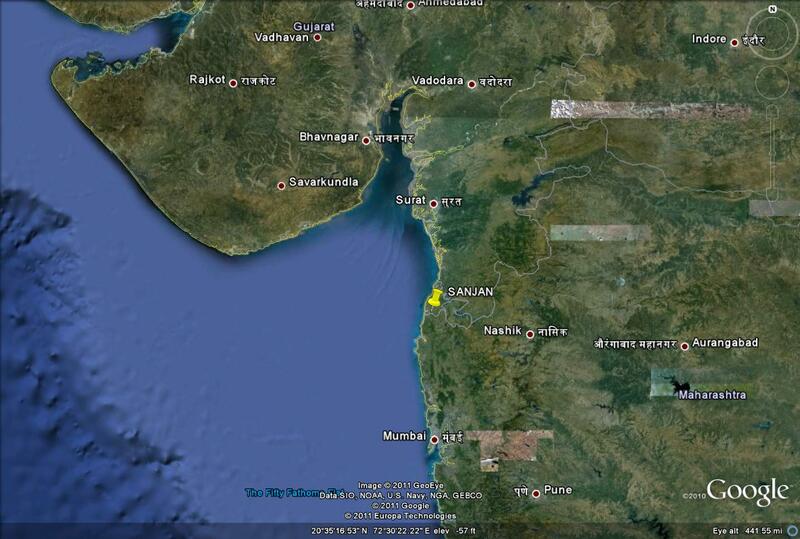 Perusal of the toposheet revealed a village called Sanjan Bandar roughly two km to the north of the station. 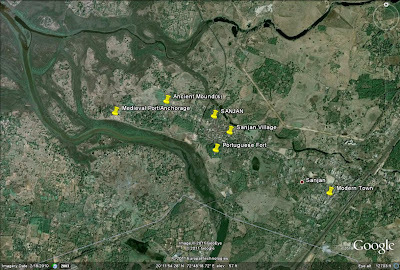 The village was situated opposite an old Portuguese Fort and led to the machchhivaad (fisherfolk village) and bandar (anchorage) roughly another kilometer to the north and on eastern bank of the Varoli River/Creek. We stopped the car on a road that was built along the very bank of the Varoli and parked under a vad (banyan tree) to start our journey up the machchivaad village mound. We were stopped short, in our tracks, by the tree. The tree was growing along the bank and its exposed roots were holding a mass of medieval burnt brick and brickbats. We had found the ancient mound. 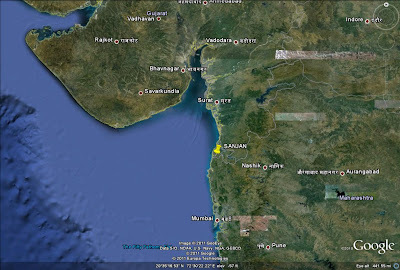 We conducted a brief exploration and headed back to Mumbai safe in the knowledge that there actually was a site and that we could start conducting a detailed exploration to designate the actual site of our excavations. 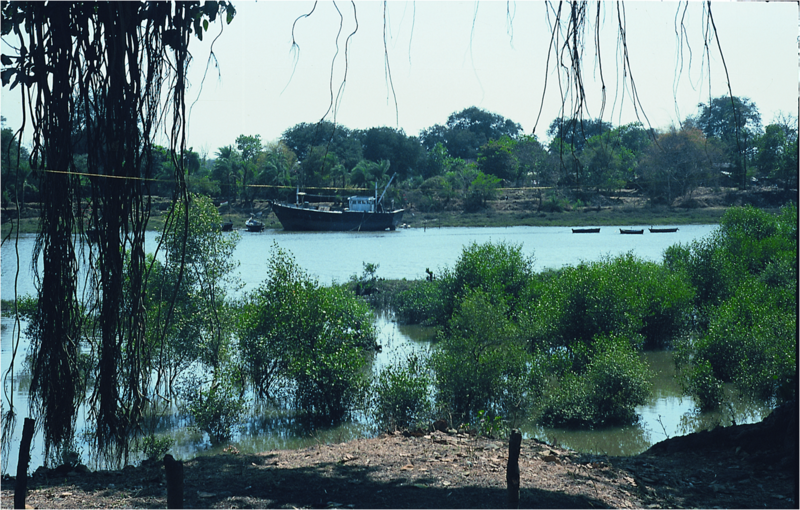 The Vad tree and the Machchhi boats parked on the shore opposite the site. V. Good beginning. Hereafter, I would expect more teeth. 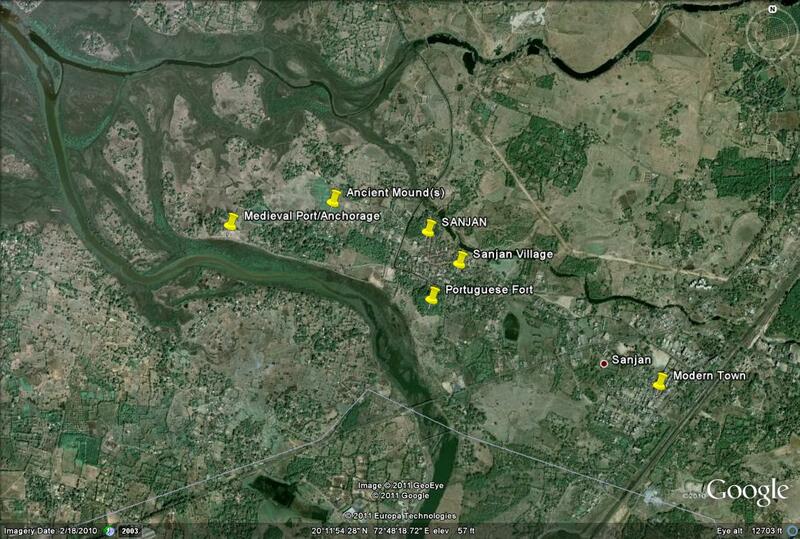 During the monsoon the Varoli is a fresh water source and during the 'dry' season there are a number of wells. In the past too there were a number of square brick wells going down to the water table which is surprisingly not too deep. Today there are 4 wells on the site of which the well at Shamsuddin Baba's Dargah is a failsafe perennial fresh water source.